A Guest Blog: By Jaden Blakeway, age 10 – Beyond H.E.L.L.O. Changing the Perception of Homelessness One Story at a Time. We were living at my Nonna’s house in Port Moody while we were waiting for our new house to be built. My Nonna came into the kitchen and was losing her mind! The freezer door was left open and all the meat defrosted! She did not know what to do! We either had to cook it or throw it away. We could not eat that much! We had chicken thighs, chicken wings, ribs, pork and sausage! My Nonna was devastated! My mom had a great idea. We decided to cook all the meat and head to the Downtown Eastside to feed the homeless. We drove downtown and my Nonna set up a buffet in her trunk. My job was to hand out paper plates, while my brother, at the age of 2, was handing out forks. My brother forgot his shoes (but that’s a whole other story)!. Soon we had a line of twenty people waiting for warm food. I didn’t know what to expect, because I was only four and I didn’t really know anything back then. However, I remember this night well because of a man named Tony. He had a bike, cool long hair and he took time to talk to my brother and I. My mom says he yelled out “Kids on the Street” so everyone would use their best manners. That was my first night helping the homeless. Later that year my mom began a project to help the homeless called Project HELLO. HELLO stands for Helping Everyone Located Loved Ones. Elementary students made hand made cards and my mom and the high school students took them to the Downtown Eastside and invited the homeless to mail cards to friends and family. I have gone with my mom and handed out food, water and restaurant tokens. I have met many wonderful people such as Sandra, Ron, Hook and Ken. I would like to tell you a little about each of them and what I have learned from their stories. Sandra was the first lady to write a card. She wrote to her daughter who lives in Alberta. Her daughter had not heard from Sandra in fifteen years and thought her mom was dead. The two ladies were so excited to hear from each other. Our family helped fly Sandra’s daughter here so they could meet. That was in 2010. Although it has been a while, we still like to visit Sandra from time to time. Now I would like to talk to you about a man named Ron Wilson- my personal favourite. I met him two years ago when my family decided to take a homeless person to lunch. I saw him crossing the road towards the park bench. He looked friendly and I felt comfortable approaching him. I invited him to lunch. He accepted. At the restaurant we both ordered burgers. He liked everything on his burger! We found out he went to my grandparents high school and that Ron had travelled the globe as a professional boxer. His final fight was against Chris Finnigan where Ron lost. We watched this fight on YouTube. Ron taught my brother and I how to clench our fists in the boxing position. Ron became my friend. Last but not least, I would like to tell about Hook and Ken who I actually just met last week. 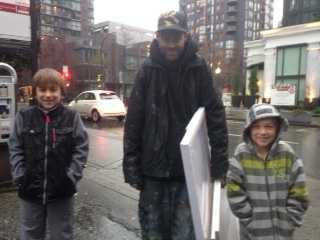 They are rival painters in the Downtown Eastside. Hook used to have a hook on one arm but now he just has a stump but he still makes great art. Ken has a scattered mind and a photographic memory that allows him to make amazing paintings. He used to be homeless but now he has a place to live and paint. We have bought two of his paintings so far and ordered some more. We don’t know when we will see them again but hopefully soon. I would love to tell you many more stories but I should probably wrap this up. I will conclude by telling you what I have learned about homelessness. Many homeless people are actually quite kind. So don’t be afraid to say hello. All of us can make a difference in the community by helping the homeless. Jaden, I really enjoyed reading your speech. There are a lot of adults that could learn from you…….learn about the joy to be found in getting to know the people of the Downtown Eastside, listening to their stories of their lives, and the value of friendship and kindess. That was the best speech for a grade 5 student I have ever read, Your kind heart and compassion shine through it because you believe in your words and you live them. I am so proud of you Great job. Absolutely brilliant – what a lovely story – so beautifully written !! Well done and what an inspiration for us all ! !